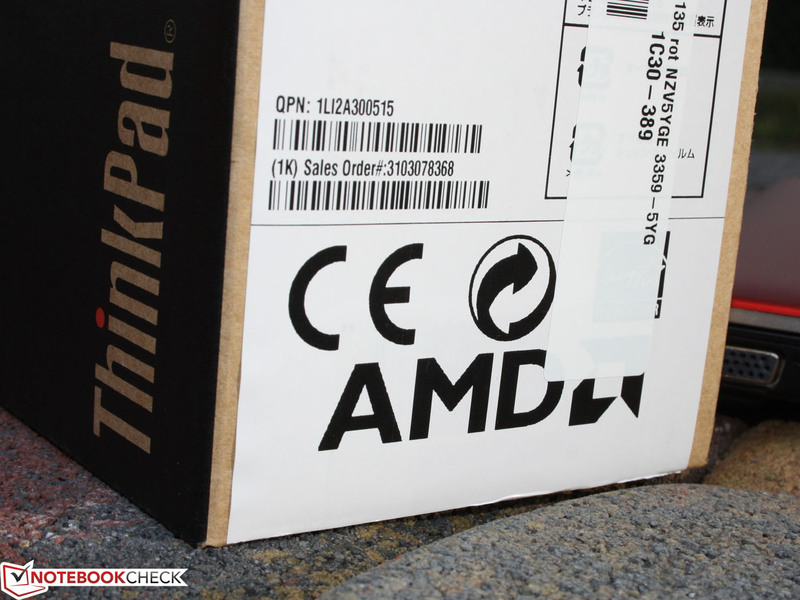 AMD ThinkPad. 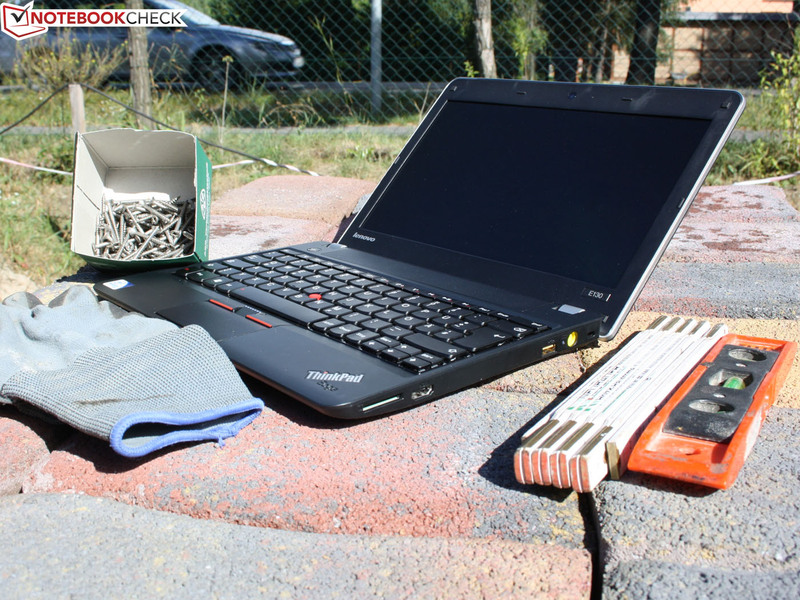 A ThinkPad for little money always sounds like hitting a home run. We looked at the AMD version of Lenovo's successful mini and found advantages over the Intel counterpart. Lenovo ThinkPad Edge E135 (NZV5YGE): Intel or AMD - which configuration should the buyer put in his shopping cart? 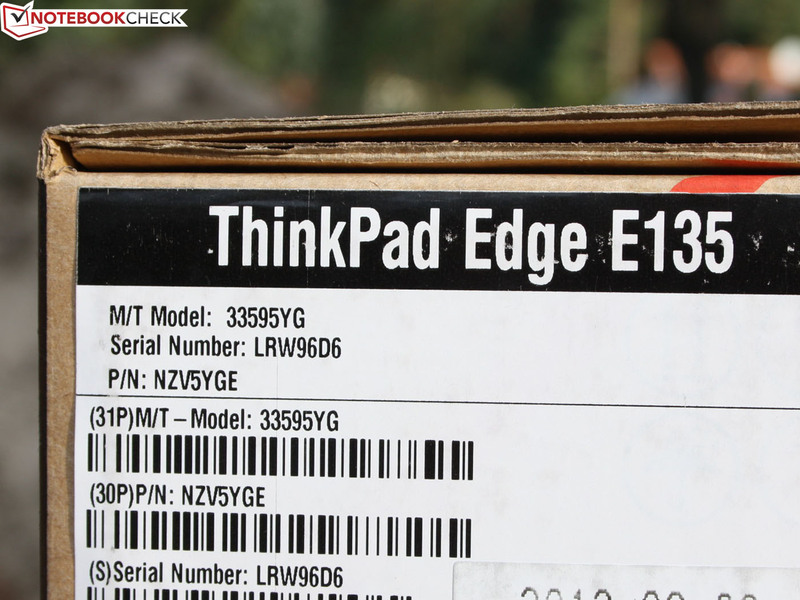 After reviewing the equally sized 11.6-inch ThinkPad Edge E130, we now scrutinize the APU-based sister model. The basic configuration featuring AMD's E2-1800 and without Windows is available starting at 350 Euros (~$454). The E130 Pentium version only costs 30 Euros (~$39) more. What advantages does our AMD model have in contrast to the Intel version? Interfaces, casing (workmanship), speakers and inputs are identical to the Edge E130. Thus, refer to the E130 review for details on those aspects as this review will immediately start with the screen and then jump to the performance assessments and emissions. The 11.6-inch screen from Chimei Innolux is the same as in the E130 (model CMN N116BGE-L32) and features a resolution of 1366x768 pixels. Consequently, the measured rates are equally bad and only differ in production and/or measurement tolerances. The TFT here has also clearly been AR-coated and the contrast of 159:1 is below average. Black could be more saturated and colors look faded rather than crisp. However, there are no alternatives in this price range. The color spectrum is an iota larger than that of the E130 and we believe this is production-related. sRGB and AdobeRGB clearly failed here as well. 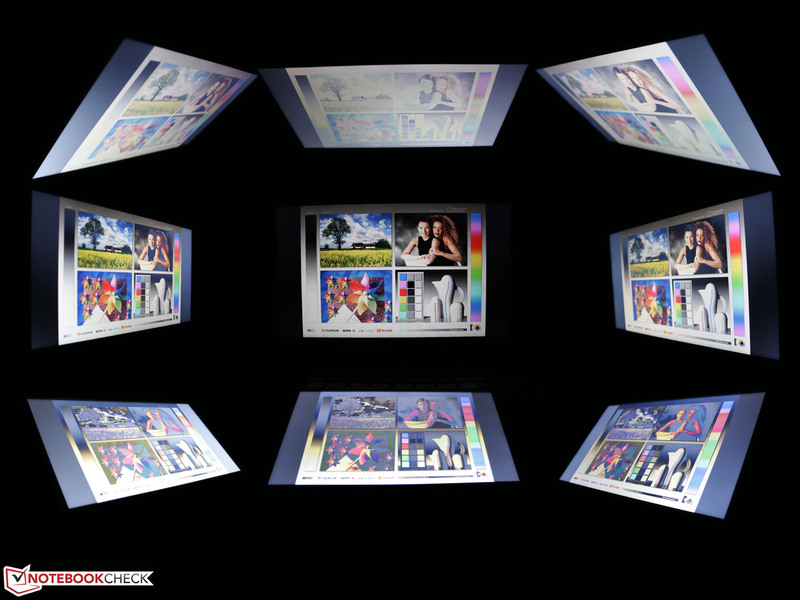 This will not trouble professional users since they edit their images on workstations or stationary monitors anyway. Those planning to work with their new E135 out in the sun will not have much fun. The 11.6-inch screen is AR-coated but the brightness is too low. It should have been at least 250 cd/m2 rather than the 184 cd/m2. Thus, we looked upon a dark screen in the sunny weather conditions during the test, which is extremely hard and stressful on the eyes. The brightness suffices for indoor use providing that the desk is not circled by light. The CMN screen's tight viewing angles are another negative. Colors and brightness distort from 45 degrees in narrow horizontal angles. It already starts at 10 degrees vertically. However, wider viewing angles cannot be expected from any laptop of this price range. Lenovo equips its 11.6-incher with AMD's 1.4 GHz dual-core E2-1800 APU (Accelerated Processing Unit). This is a combination of processor and graphics core including a single-channel memory controller (up to DDR3-1333). In contrast to the Intel CPU with integrated HD graphics, the Bobcat cores exhibit a relatively weak processing performance. On the other hand, the Radeon HD 7310 is stronger and should compensate the performance drawback. The E135's low-cost version includes an E-300 APU (1.3 GHz) and sports the older Radeon HD 6310. However, it is only a low-cost version when Windows 7 is desired. Whether there are significant differences in performance will be examined in the following paragraphs. Windows 7 64-bit is stored on a fast spinning (7200 rpm) Hitachi Travelstar Z7K500 with a gross capacity of 500 GB. The E130 Pentium model features a 320 GB model. 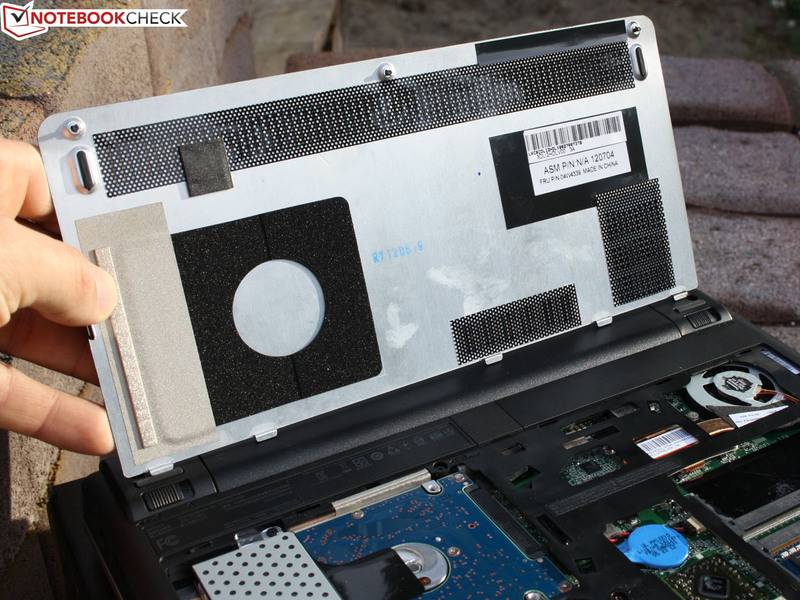 Moreover, 4096 MB of DDR3 RAM is installed in the laptop in one module. One bank is empty. We compared the E2-1800's performance (1.7 GHz) with the E-300 (Edge X121e), Pentium 977 and Core i3-2367M (all E130s) alternatives. The E2-1800 achieves 0.59 points in the Cinebench R11.5 64-bit multi-core benchmark. This result is 5% lower than Sony's Vaio SVE-1111M1E/P featuring the same APU, but is 15% over Lenovo's X121e with an E-300. The Edge E130 model based on the Pentium 977 is 83% faster. And the Intel version gains up to 125% more processing power when an i3-2367M joins in. The comparison does not look as grave when the Radeon HD 7340 can show off its power in the OpenGL benchmark. It is 24% faster than the HD Graphics in the Pentium and 13% faster than the HD 6310 in the E-300. It is also still 10% faster in contrast to the HD 3000 in the 2367M. The CPU performance remains stable on battery power. The R11.5 multi benchmark finishes with the same result as in AC-mode. After the poor CPU specs, the application performance, measured using PCMark 7 and PCMark Vantage, is unexpectedly good. Our test device can surpass other AMD E2-1800 systems by 10 to 13% (e.g.Vaio SVE-1111M1E/P). 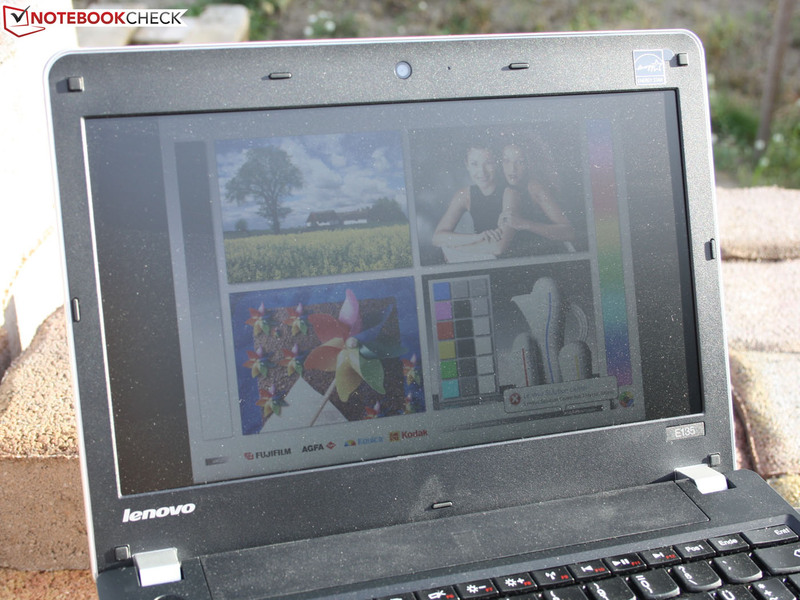 The Pentium-based E130 is only 38% faster (57% with a 2367M - see Asus UX32A-R3001V). Lenovo's X121e (E-300, 7200 rpm) is 15% slower. The same is seen in PCMark Vantage, where the advantage is 26 (E-300) to 16% (other E2-1800) and the backlog is 40 (Pentium 977) to 59% (2367M). A backlog of 40% to the Pentium Edge E130 sounds like a big step. 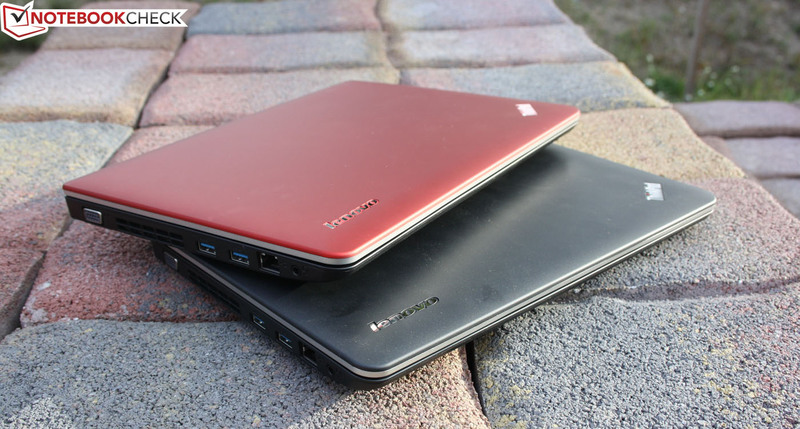 However, we should remember the difference of 108% of ultrabooks systems sporting an i5-3317U. The experienced work speed first changes noticeably for the user here. Or in other words: A fast motorbike is far from being a motorcycle. We depicted PCMark 7's system storage score above. Seagate's 320GB Momentus Thin in the E130 sister model is relatively swift for a 7200 rpm HDD but 8% slower than Hitachi's 500GB, 7200 rpm disk in our E135. SSDs, like in Toshiba's Z830, could reap in twice as many storage points. The read rate of 90 to 118 MB/s is a top achievement for a spinning hard disk. The access time of 17.3 ms is also fairly low. However, the 4K read score again indicates the midfield of hard disks. Even 5400 rpm HDDs can read smaller files up to 45% faster in this regard. The Radeon HD 7340 is the powerhouse in AMD's E2 series (DirectX 11). The Turbo Core runs with 523 - 680 MHz. Please see the Radeon HD 7340's data sheet for technical details. How does the Radeon fare in comparison to Intel's chip set graphics (low voltage versions)? The OpenGL test above already conceded advantages for AMD's GPU. 3DMark 11 finishes with 366 points, which is common for this GPU. That is 25% more than a HD 6310 (E-300) achieves. No comparison rates are available for the HD Graphics or HD 3000 due to the lack of DirectX 11. Comparison values are available for the 3317U's HD 4000 which is a typical ultrabook CPU. It is 15 to 70% faster depending on the Turbo capacity. The older 3DMark 06 is 10% faster than with an E-300 (Lenovo X121e) but only 7% faster than with a Pentium 977 (E130). Will the games also show negligible differences? The many red boxes indicate that games clearly don’t play well on the E135. Merely FIFA 13 ran smoothly in low details. It obviously jerked in medium details right away. All APU systems featuring an HD 7340 or HD 6310 have an extremely weak gaming performance in common. The Pentium 977's HD Graphics is a bit better with +30 - 35%. However, you need an i5-3317U's HD 4000 for games to run smoothly even in low details. Is the E135 or the Intel-based E130 louder? It is our E135 test device. The read/write heads whirring and clacking is marginally louder than the ones in the E130. Consequently, the minimum noise level is a bit louder. The fan was never inactive during the test but it is quieter than the HDD anyway. Both models are on a par during load. We measured a maximum of 35 dB(A) in both cases. A 3D Mark resulted in 34 dB(A). All in all, the E135 is a very tolerable office machine. The Edge's casing did not even get lukewarm while idling. The underside's average temperature was an evenly distributed 34 degrees Celsius. The wrist rest only reached 30-32 degrees. The temperatures hardly increased noticeably during permanent load. 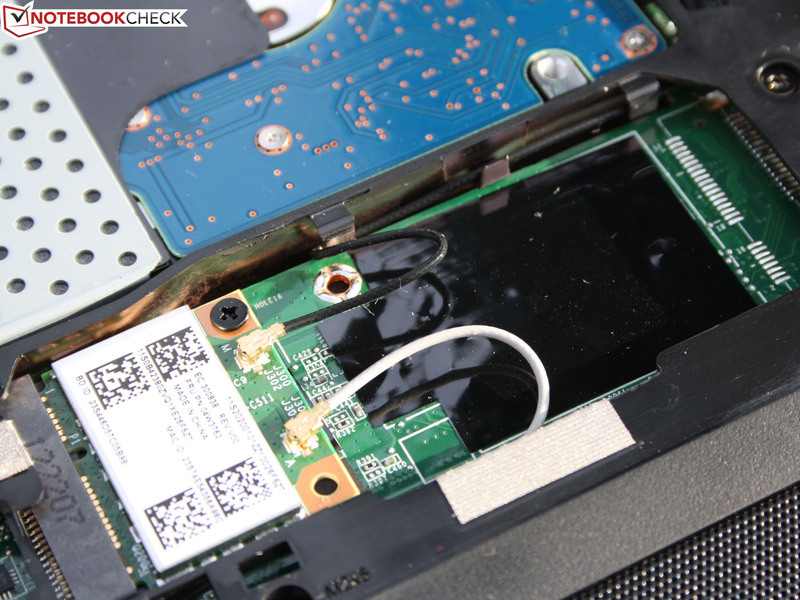 Merely the hot spots in the keyboard's center and below the touchpad got noticeably warm. Here, 40 degrees are selectively possible but it is nevertheless still a normal temperature increase. The Intel counterpart got slightly warmer. It is always possible to use either one of the Edge models on the lap. The APU does not feature a Turbo mode and thus throttling is not an issue. The E2-1800 processes stably with 2 x 1.7 GHz in both Cinebench R11.5 multi and the stress test. (±) The average temperature for the upper side under maximal load is 35.2 °C / 95 F, compared to the average of 29.8 °C / 86 F for the devices in the class Netbook. 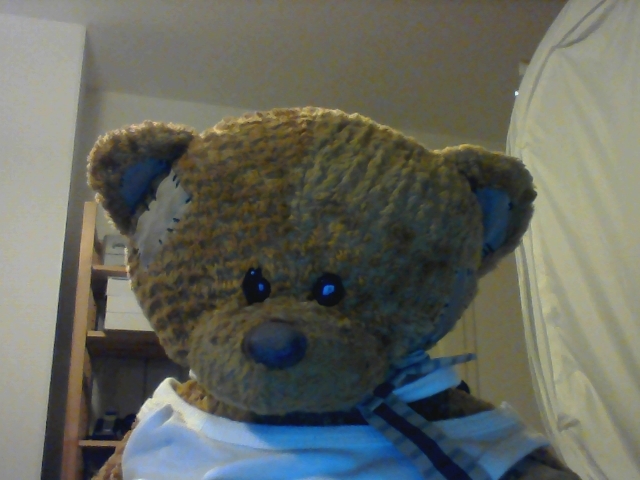 (+) The maximum temperature on the upper side is 38.2 °C / 101 F, compared to the average of 33 °C / 91 F, ranging from 21.6 to 53.2 °C for the class Netbook. (±) In idle usage, the average temperature for the upper side is 32.7 °C / 91 F, compared to the device average of 29.8 °C / 86 F.
(-) The average temperature of the palmrest area of similar devices was 29.3 °C / 84.7 F (-5.7 °C / -10.3 F). Price-conscious buyers are usually also eager energy savers and want to know how much power is consumed (before the PSU, without battery charging). We measured eight to ten Watts at idle. That is not much, but common for APU devices as well as for Intel's low voltage systems like the Edge E130. It roughly consumes the same amount of power with 7.5 to 11 Watts. 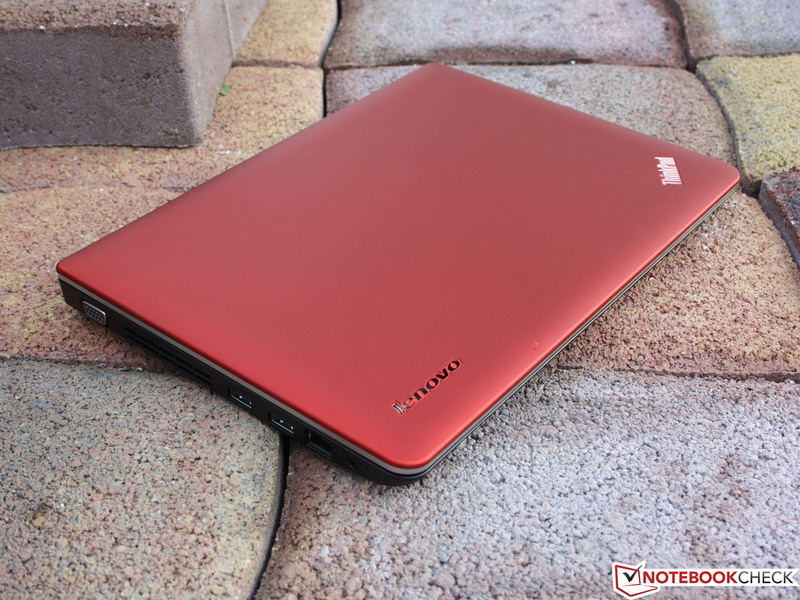 However, even devices with the typical i5-3317U ultrabook processor prove to be just as energy-efficient although they exhibit the highest performance: Aspire V5-171 - 7 to 10 Watts (11.6-inch). The 11.6-incher drained 24 Watts from the outlet during a 3DMark 2006 and 29.5 Watts in the stress test. The Pentium-based E130 consumes more in both load scenarios with 27 and 33 Watts. However, this is still acceptable seeing that the Intel alternative's system performance is 40% higher. The 65 Watt PSU can charge the battery even during periods of high load, e.g. maximum power consumption. It needs 2:37 hours for this process when the PC is on. That long battery runtimes are not exclusive to expensive devices is nothing new since netbooks. We are basically viewing a netbook since AMD positioned its Brazos APUs against Intel's Atom in 2011. After all, where else would a user be willing to accept the lower performance for the benefit of a long runtime if not in a netbook? With six hours (Wi-Fi surfing: 322 minutes), the Edge E135 sets the yardstick for 400 Euros (~$518) devices. A script opens a website, some with video contents, every 40 seconds in this test. The load runtime in FurMark (GPU stress) and Prime95 (CPU stress) are much shorter. However, three hours are still impressive. The E130 also only lasted 10 minutes longer in this test. We have to point out that the runtime of 9:27 hours at idle is a theoretical period that will unlikely be reached in practice. Here, the brightness is set to minimum and the wireless modules are disabled. 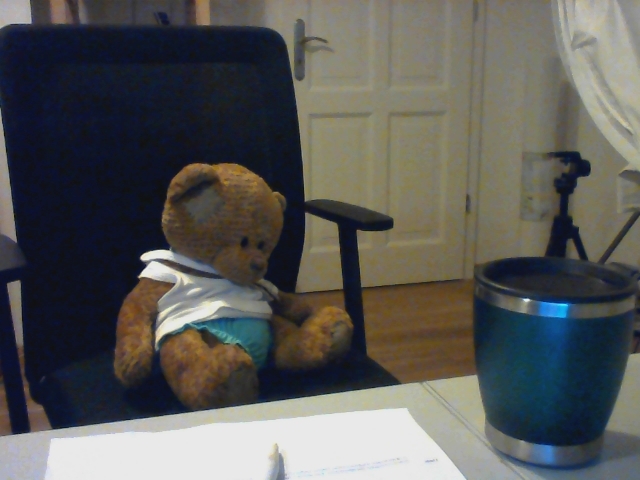 Office suitable, 11.6-inch competition featuring a good runtime for less than 450 Euros (~$583) is scarce. Acer disqualifies its Travelmate B113-M's runtime due to the 37 Watt hour battery (3 hours Wi-Fi test). This also is true for the Aspire One 756 (new: non-glare according to shop offers) and the Aspire V5-171. 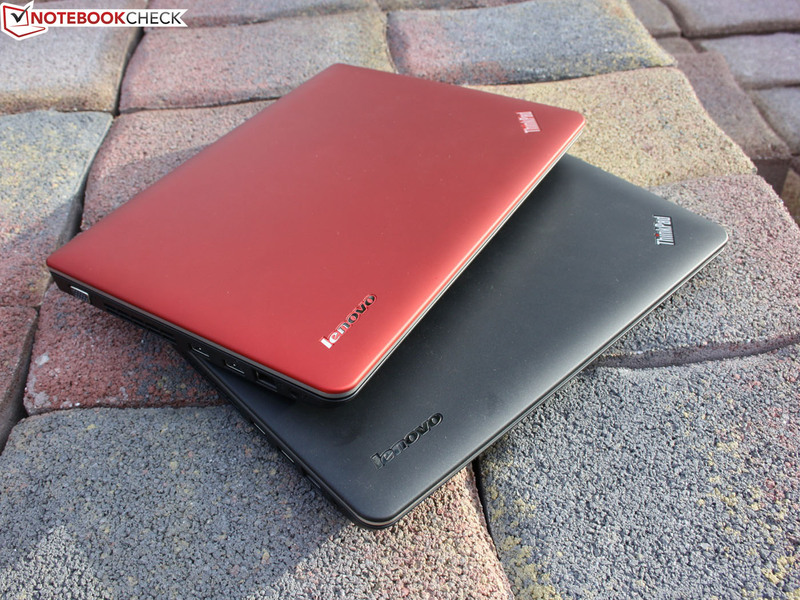 So, only the ThinkPad X121e (seven hours) and Samsung's 305U1A (nine hours) based on AMD's older E-450 are left. The same chassis, screen, input devices, battery and (almost) the same hard disk. 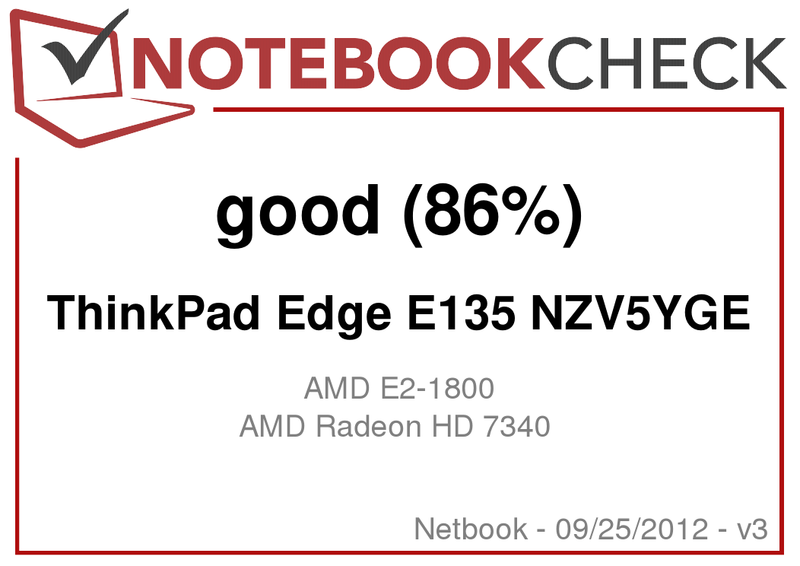 It was virtually predictable that Lenovo's ThinkPad Edge E135 (NZV5YGE) and the Intel Pentium E130 counterpart will hardly show differences - not even in terms of price. 350 or 380 Euros (~$454 to $493) (free DOS) hardly makes a difference. The biggest difference is the CPU's pure power, where the AMD test system is at a disadvantage. The total application performance however only shows slight differences between the two. 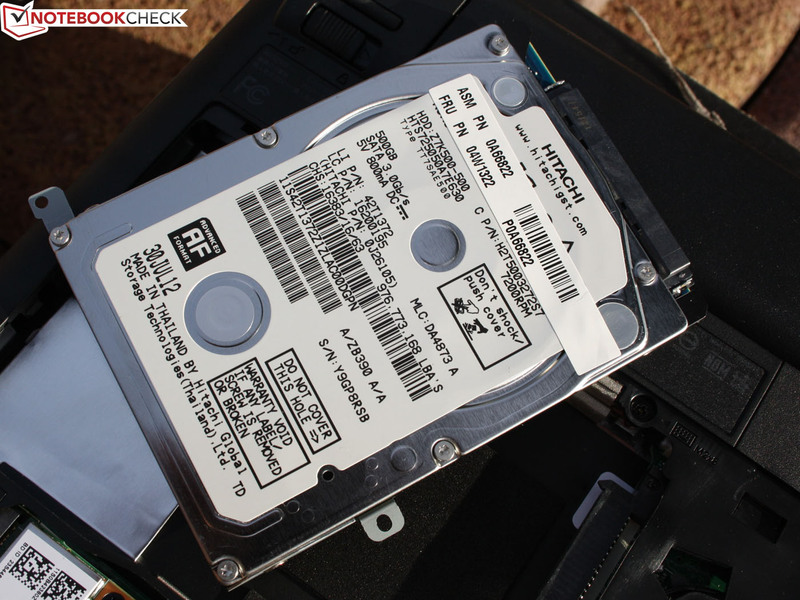 The E135 can compensate a few points with its faster HDD, also a 7200 rpm. The Radeon HD 7430 is not necessarily stronger than the Pentium's IGP (see gaming tests). Even the battery runtimes hardly differ if at all in the test. However, the E135 has a lower load power consumption. In total, we can give the E135 the same, unreserved recommendation as for the Pentium-based E130. 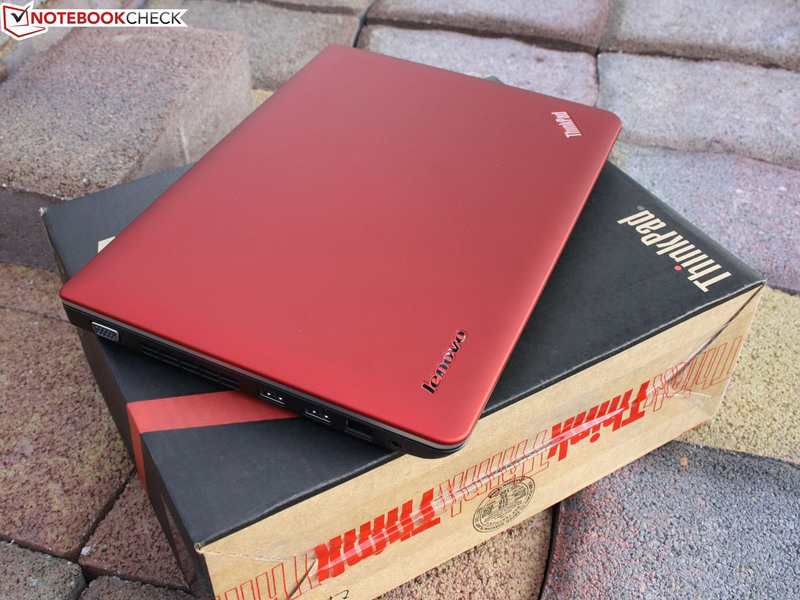 Lenovo has created a very good work companion that lives up to the ThinkPad name from A to Z. This statement is true in view of the price range of under 450 Euros (~$583). 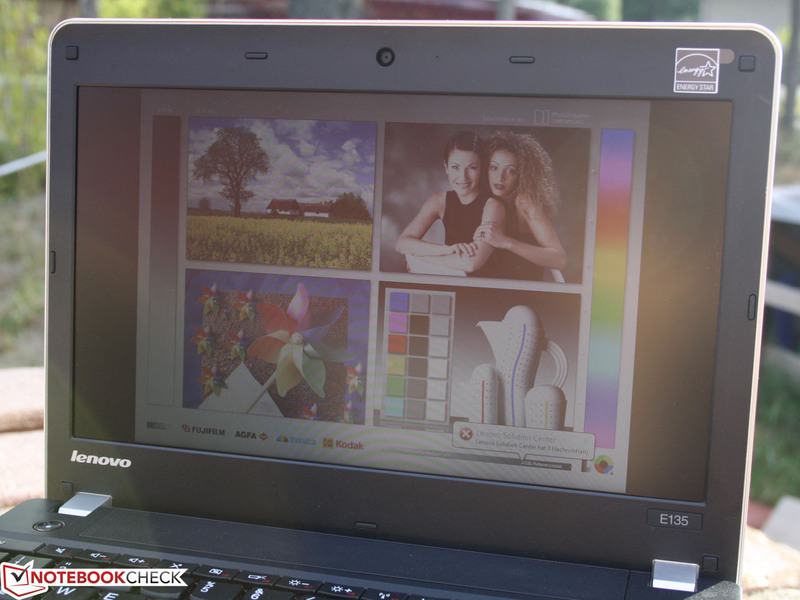 Lenovo ThinkPad Edge E135 (NZV5YGE): Low power consumption, slightly lower waste heat but also less computing power. You don't want to spend much money? If possible less than EUR 400? Lenovo ThinkPad Edge E135: The AMD model's battery life is similar to the Intel-based Edge E130's runtime. and overexposes extremely in daylight. 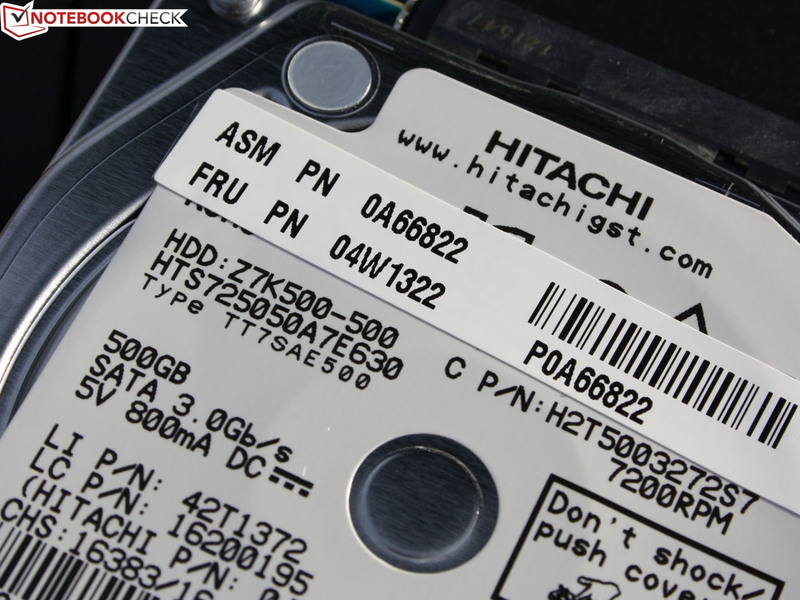 Hitachi's 7200 rpm model provides very good read and write speeds. The hard disk is directly beneath the keyboard which yields marginally only here. The UMTS module in the E130 premium sister model is inserted here. However, it cannot be upgraded because the base is not soldered. 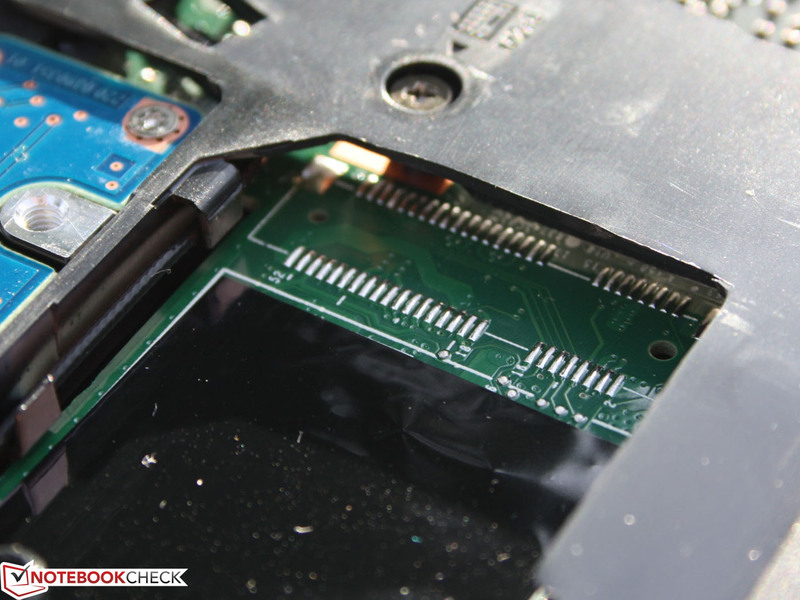 An empty slot on the mini PCIe beside the Wi-Fi module. 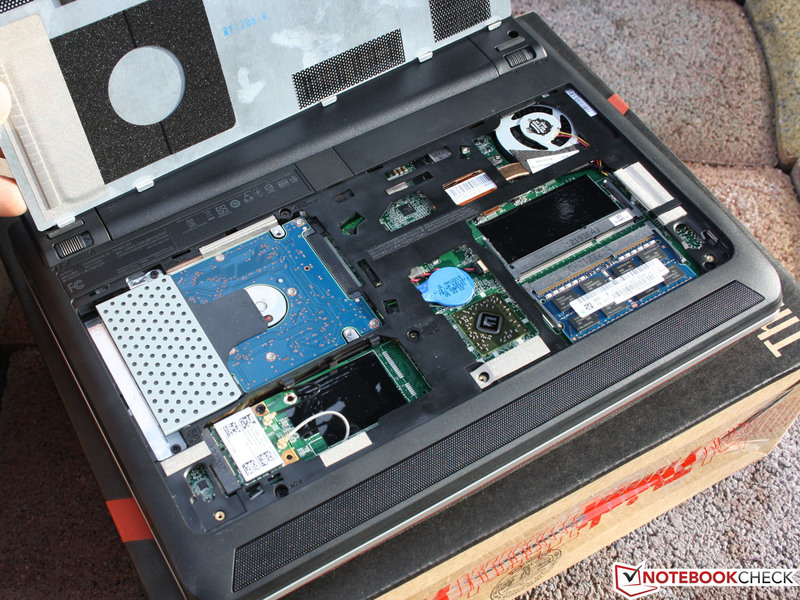 Remove three screws, open the cover and the innards can be accessed. Not even maintenance is a problem. 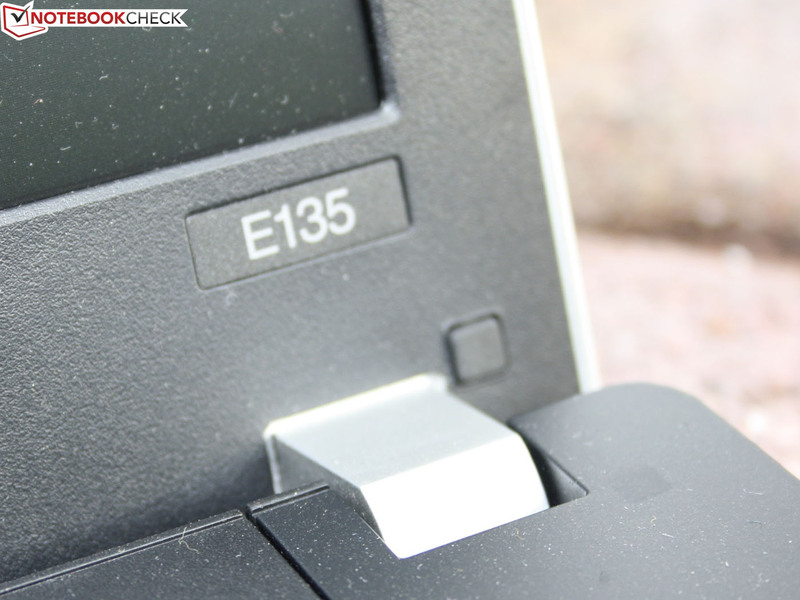 but the Edge E135 is a well-rounded netbook bundle that almost has no drawbacks. 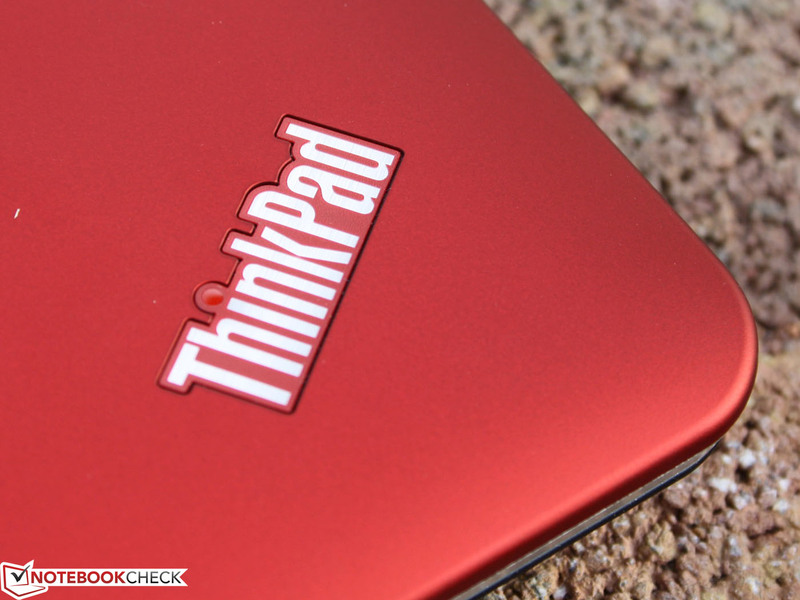 Then there is only one alternative: A ThinkPad Edge from Lenovo. 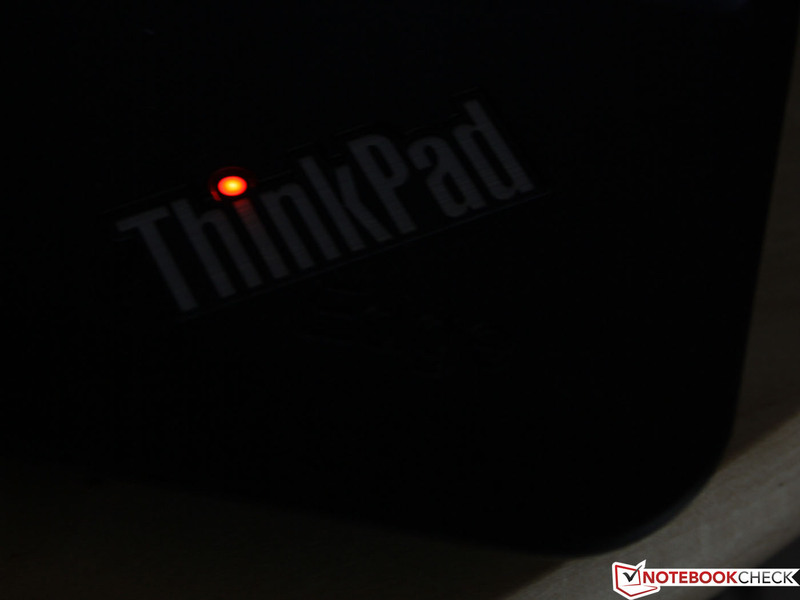 Very important: The logo should indicate the operating state (ThinkPad's i-dot lights up on wrist rest and lid). It should also have a stylish red cover? Or maybe black after all? And a matte screen goes without saying. It should last for a long time? And have perfect inputs? But you expect a lot from your portable companion? The E135 is available in both black and red. The lid's pretty red paint is non-slip and prevents fingerprints. There are even two USB 3.0 ports. 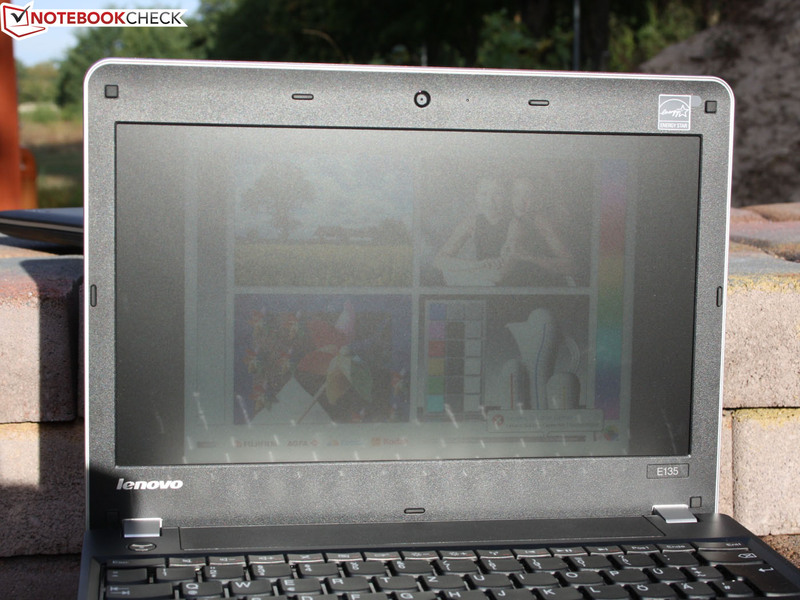 A brighter screen like already in the Edge E130. A different platform but even the innards have the same set up. 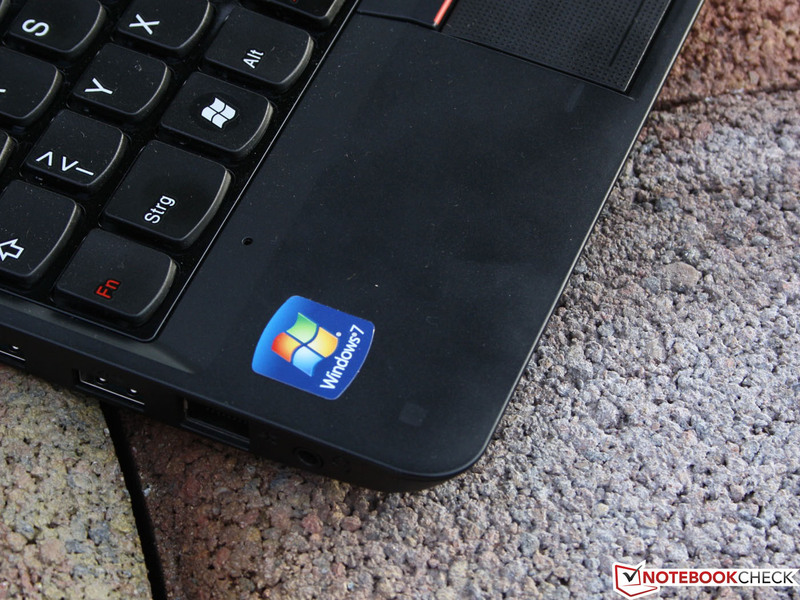 The keyboard is almost identical with the pro-ThinkPad E125.